The North Carolina Coastal Federation recently collaborated with DREAMs of Wilmington, Inc. to install a work of art at the Fred and Alice Stanback Coastal Education Center in Wrightsville Beach. Zach Lee, AmeriCorps member at the federation’s southeast office, visited DREAMs to discuss with a group of middle school students our coastal habitats and brainstorm ideas for creating an art project that would inspire viewers to protect the natural habitats of the N.C. coast. 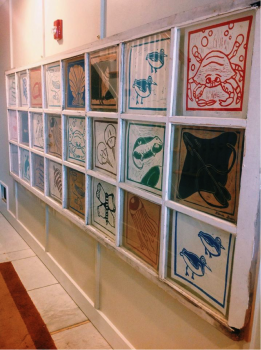 Using a woodblock print screening method, students first carved a design into a block of wood and then printed their carving onto a sheet of paper using various colors of ink. The result is a collage of brightly colored coastal species such as periwinkle snails, rays, and horseshoe crabs that now decorate the panes of an original window from the historic 1948 Palmgren-O’Quinn cottage. The federation will be hosting a private art showing for DREAMs students at the Fred and Alice Stanback Coastal Education Center later this month. Students will have an opportunity to view their work for the first time, fully installed and displayed in the entrance of the education center. Zach will also be leading students on an adventure to a local marsh where they will learn more about the many different species that live in our coastal waters.